The information on this page was found by Tina. Most of the information on this page is verbatim the resource. Some of the information found may have been altered or deleted based on actual copies of original documents of proof. The Caudill line comes from Ruby P. Stines' side of the family. Ruby's mother, Belva Cooper is a daughter to Laura Belle Caudill . Laura Belle (1879 - 1963) is a daughter to Samuel Caudill (1848 - 1923) who's father is Abel Caudill. Abel Caudill (1817 - 1898) we'll have to talk about later. Abel's father is Matthew Caudill born 1760 in Lunenburg, VA and died in February 1837. His father, James Caudill (1718 - 1805) and James' father Stephen Caudill, born 1680 and died 1759. Stephen Caudill is accepted as the progenitor of our line of Caudill's who settled in America. Stephen was of Scotch descent and born in Scotland. He came to America about 1700. On August 5, 1731- Stephen Caudill paid twenty shillings for a King George II patient for 195 acres on the North Side of Nottaway River in Old Surry County Virginia, which later became Brunswick and then Lunenburg County. A patent to the people then was the same as a deed today. On the tax list for 1752, Stephen Caudill apprears on the list with his son James paying two tithes. Tithables are men who are eligable for military service. There is little information about Stephen Caudill, other than he married Mary Elizabeth Fields. Their children: Sampson born about 1717 (nothing more is known about him) and James who was born about 1718 (or maybe about 1720) in Surry Co., VA. Stephen followed his sons to North Carolina. James Caudill (son to Stephen) married Mary Yarborough on 1 Jan 1749. Together James & Mary had ten children. The Wilkes Co., NC census in 1784 listed James Caudill (wife Mary Yarborough) at age 60. On the 2 Nov 1784 he bought 140 acres from Benjamin Morgan for 50 pounds. (Wilkes Co., NC Deed Book A-1 Page 452) This land was on Sandy Creek, near the Fork of Brush Creek on the Middle Fork of Roaring River. The Roaring River splits into three streams in the northern part of Wilkes Co., NC. This split is south of the Blue Ridge Parkway. James Caudill was a minister and the minutes of the Old Roaring River Baptist Churt list he and his wife (Mary Yarborough) as members in the 1780's and 1800's. He died in North Carolina and is probably buried in wilkes Co., NC. James Caudill Jr. married Mary Adams. (Mary Adams is said to be a twin sister to Sarah Adams who married James' brother Stephen) James died in Perry (now Letcher) County, KY. It is told that it was his dying wish to be buried on his own land which was on Rockhouse Creek, just off present KY Rt. 7, near Blackey, Letcher Co., KY. A Kentucky Highway Historial Marker honoring his Revolutionary War Soldier has been erected on KY Rt. 7, near the cemetery where his grave is marked with an aged stone. James Caudill Jr. served during the Revolutionary War in the North Carolina Fifth Militia, under Captain Samuel Johnson, Colonel Ben Cleveland and others. He was at the Battle of Kings Moutain in South Carolina but wasn't involved in the fighting. After the battle, he and his brother Stephen guarded prisoners. In his Pension Application he gave his birth place as Lunenburg Co., VA and states he was born in 1753. He served 9 months in the Revolutionary War from Wilkes Co., NC. He and his brothers, Thomas & Matthew, left Wilkes County in 1789 to settle briefly in South Carolina. There James Jr. and Thomas were included in the 1790 Pendleton District, SC Census. Matthew seems to have missed the head count. It is believed that he was in the household of brother Thomas, as there was a couple about his age listed in Thomas' household. The 1793 tax list show that James Jr. was back in Wilkes Co., NC and Matthew was back in 1799. Based on other available tax lists, James Jr. (Revolutionary War Vet.) and his brother Matthew came to Floyd Co., KY (Area that is now part of Letcher Co.) between 1805 and 1810. Stephen, who was also of Revolutionary War Soldier, remained in Wilkes Co., NC through the 1810 Census. Later that year Stephen arrived and was one of the organizers of the Indian Bottom Baptist Church in 1810. Stephen also helped organize the Ovenfork Baptist Church in Letcher Co., KY in 1820. Thomas A Caudill first appeared in the public records of Wilkes Co., NC tax list in 1787. The census taken in 1790 in Pendleton District of SC list him and another couple of about the same age in the household. This couple was probably Thomas' brother Matthew and his wife, Sarah. He migrated to Robertson Co., TN and by 1805 Thomas migrated to Franklin (presently Simpson) Co., KY. Thomas married and lady named Mary. Unsure of her last name. He died 5 May 1848. Little is know about Matthew. He married Sarah Webb. She was born 8 Nov 1788 in North Carolina. Matthew Caudill died from falling of the roof of his the house. They were living in Letcher Co., KY.
Stephen Caudill married Jane DeHart (1762 - 1790) in Wilkes Co., NC. on 3 Mar 1784. When Jane died in 1790 he married Sarah Adams. Sarah was born about 1779 and died in Perry Co., KY in October of 1842. Benjamin Adams was her father. Stephen (1763 - 1839) also servced in the Revolutionary War. He served three terms. He fought with his brother James Jr. at the battle of Kings Moutain in SC. The Battle at Cowpens near Spartanburg, SC was another that Stephen fought in. Stephen Caudill's will is recorded in 1828 in Perry County Kentucky Book B, Page 210. He was to leave his wife, Sarah- the farm for her life time, 2 sows, 1 pig, 2 cows, 20 hogs, 6 sheep, the farming tools, and the household utensils. On 26 July 1839, near the mouth of Dry Fork Creek (Kentucky River)- Stephen Caudill died. He was about five miles down the river from Whitesburg, Letcher Co., KY while on the way to the grist mill with "a turn of corn". He is buried in the Watty Caudill Cemetery near the mouth of the Dry Fork Creek of the Kentucky River, about five miles down the Kentucky River from Whitesburg. ABNER CAUDILL 1775 - ? Abner Caudill was the only of his siblings born in Wilkes Co., NC. He remained there when his brothes, James Jr., Thomas and Matthew left the county to settle briefly in Pendleton District, SC. Abner married a Jane Adams who was born in Rowan Co., NC about 1804. She was the daughter of Spencer Adams. Abner and James are both buried in the Caudill Cemetery below the Bethany Ford Bridge on the East Side of the Roaring River in Wilkes Co., NC. Per my resources for this information, the Indian Bottom Baptist Church was still in existence in 1992. The church is located just outside Blackey Kentucky on the KY Hwy 7 (Route 7). It was located on a plateau on the side of the hill with a narrow gravel road leading up to the church. There is a sign on Route 7 where you turn to go to the church, which reads: "Indian Bottom Baptist Church, established 1810, meets every 3rd Saturday and Sunday". At the Saturday meeting, the business of the church is conducted. Their church service is held on Sunday. After the post office arrived, Indian Bottom's name was changed to Blackey. Like the Indian Bottom Church, the Oven Fork Baptist Church was organized by several people. One or more of which are Caudills. 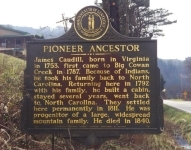 James Caudill, early pioneer is one of the organizers.